Making your own light, crumbly pastry is as easy as pie. Just follow these simple instructions. This method describes how to prepare a tart case before adding a filling, but you could also use this pastry for pies and pasties. 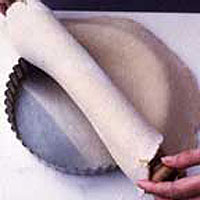 The uncooked pastry can be refrigerated for up to 3 days, or frozen for up to a month. Sift the flour into a bowl and stir in the salt. Add the butter (and lard, if using) and, with your fingertips, rub it into the flour using a swift, light action. As you do this, keep lifting your hands high above the bowl to aerate the flour and keep the butter cool. Alternatively, pulse the flour and butter in a food processor. Either way, continue until the mixture resembles breadcrumbs. Sprinkle the water over, a tablespoon at a time and, with a knife or fork, work it gently into the crumbs until you have added just enough to form a soft dough. If using a food processor, add the water while the motor is running. If it's still crumbly, add another tablespoon of water, or more if necessary - but the less liquid used the better. Water makes the pastry easier to handle, but too much will produce a hard crust that is more likely to shrink in the oven. Exact quantities of water cannot be given as the amount flour absorbs can vary significantly each time. Lightly flour your hands and briefly work the dough into a ball, picking up all the crumbs. Wrap the pastry in clingfilm to prevent it drying out and chill in the fridge for at least 30 minutes (preferably 1 hour). Remove the pastry from the fridge and turn it out onto a lightly floured surface. Dust a rolling pin with flour. Roll the pastry out so that it's slightly larger than your tart tin. Rotate in quarter turns as you roll to get an even circle. Use the rolling pin to lift the pastry and lay it over the top of the tin. Press the pastry into the tin and, with a sharp knife, trim the edges. Prick the base a few times with a fork. Chill for 30 minutes more. Preheat the oven to 190°C, gas mark 5. To 'bake blind', line the pastry with greaseproof paper and fill with baking beans or uncooked rice. Bake for 15 minutes until half-cooked, then remove the paper and beans. Return the pastry to the oven for 5 minutes to dry out. Let it cool. You now have a part-baked case that can be filled and baked again - as with a quiche. However, if you want the tart case to be completely cooked so you can add a filling that requires no more cooking, such as cream and fruit, bake for another 5-10 minutes. If you're worried about the pastry shrinking as it cooks, don't trim the edges before baking. Bake blind, cool, then trim off the excess with a sharp knife.